One of the biggest news stories of 2009 revolved around the “crash gate” episode. We are all familiar with the story of Nelson Piquet Jr. intentionally crashing so that teammate Fernando Alonso could take victory. Flavio Briatore and Pat Symonds were both blamed for the incident and received a lifetime ban and 5 year ban from FiA competition. The verdict on the appeal filed by Flavio and Pat was released today and the fiery Italian boss may be back a lot sooner than Max Mosley had hoped at the time of punishment. Flavio had filed the appeal under the notion that he had been a victim of a personal vendetta from then FiA President Max Mosley. The French court agreed with Flavio about the irregular judgment and overturned his lifetime ban from the sport. Flavio received 15,000 Euros in compensation which was far under the 1.4 million that he was hoping to get. Along with Flavio, Pat Symonds too had his FiA ban lifted as well as both men can now return to competition. The French court basically indicated that the ban was a conflict of interest due to the ongoing arguments between Flavio and Max at the time punishment was rendered. 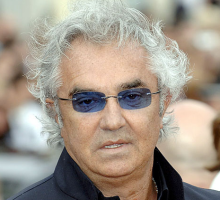 It was no secret in the F1 paddock that neither Briatore nor Mosley cared for one another. Nelson Piquet was given immunity through the whole incident as he was used to light the original match. Nelson has all but received his own lifetime ban as no team has contacted him about potential ride offers. Unlike Nelson, I am nearly 100% that Flavio and Pat will be back to Formula 1 in the near future. The FiA has announced they may appeal the decision which would see Flavio still sitting out; however with the departure of Max, it may be interesting to see what the decision of Jean Todt is. It is my own personal hope that with all the good F1 news we have had this off season that perhaps we drop this issue and move on with a clean slate from the Mosley era. While the whole situation was wrong on every level, there is no sense in dragging more political drama into the mainstream media. Move on and hope that this whole incident has been a learning tool by all teams in the paddock. What is the opinion of the fans out there? Should Flavio be allowed back? The courts finding was that since Flavio was not an FIA license holder, that the FIA had no jurisdiction to levy such a penalty against him. Further, it was seen as suspect that Flavio and Pat were not allowed to form any defense against the FIA’s findings. Somewhere in Chelsea, Max is has just entered an intense therapy session with 5 highly trained professionals. This has to be devastating for him.